Here's a simple interaction org chart shared in an e-learning challenge. Use this interaction to introduce a group of teammates or show your organization's structure. The template is fully editable so you can customize the fonts, colors, and layout for your own projects. Customize the org chart graphics, fonts, and colors! Hi Eni - Sorry I missed your comment!! You can change the pics by clicking the pictures and then going to States > Edit States. From there you can swap out the picture graphic. Please let me know if you have any further questions. Love this and want to use it, how do I edit the boxes with the pictures and titles in it? Hi Gregory! To edit the profile graphics, select a graphic > Click States > Edit States. The text is fully editable within Storyline. HI Eduardo! 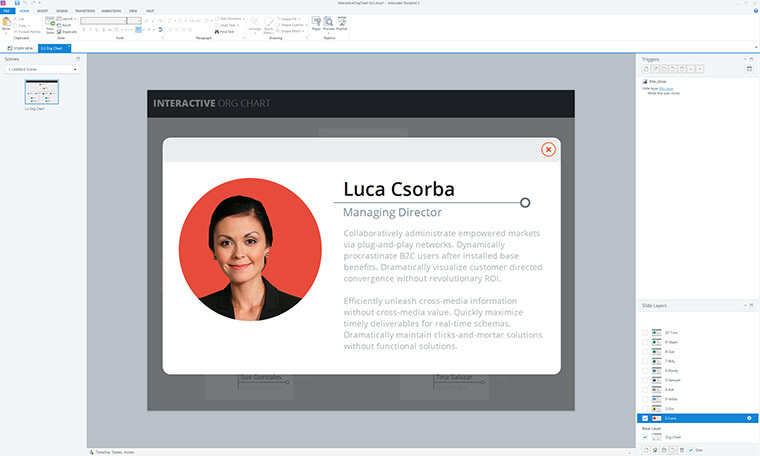 This interaction was built with our Storyline authoring tool: https://www.articulate.com/products/storyline-why.php You'll need Storyline 2 to open and edit the file. Hi Craig - Sorry I missed your comment! Yes, you can change the header by clicking F4 or by going to View > Slide Master. I placed the title on the slide master. The font used is Storyline 2's default font, Open Sans. Let me know if you have any further questions! David, this is fantastic, thanks for sharing. I have been able to edit most of the chart, but I was wondering how to edit the line with the circle to the right on the slide layer with the bio. I made the box smaller in edit states, and discovered you cleverly made a shape out of several shapes. The only part I can't seem to get where I need it is the circle next to the line. Love this! Thanks for sharing. How can I edit the lines? I have people at different levels than the sample, and need to delete some lines. This is fantastic! Thank you so much sharing! David, amazing org chart... so simple but extremely creative. Thank you for sharing great ideas. David are you coming to DevLearn? Hi my old friend! Yes, I'll be there. Looking forward to seeing you! 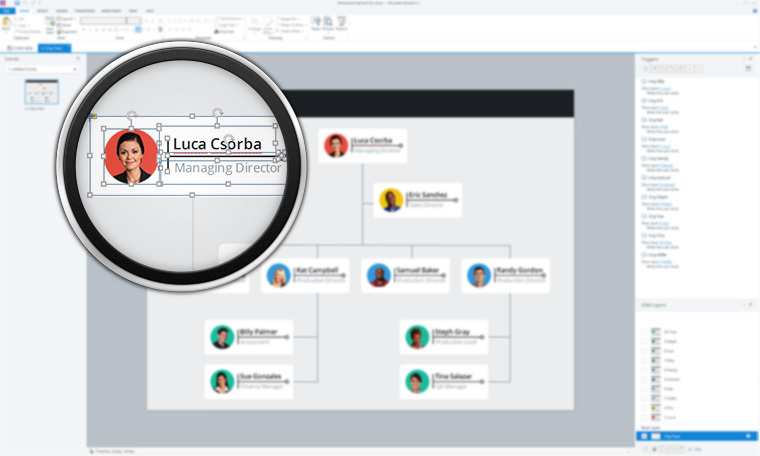 You can create slide type org charts in power point as well as from Creately Org Chart Software. You have to create links to the each object or different diagrams in the software. Its kind of an easy to use alternative as of the templates library.